NEW YORK (Sporting Alert) — Scores, results and records from the College Football Week 10 action that took place this on Saturday. No. 1 Mississippi State survived a strong challenge from a very determined Arkansas side to stay undefeated this season and improved to 8-0 with a come from behind 17-10 victory. Dak Prescott threw for a personal-record 331 yards on 18-of-27 passes and one touchdown, to lead Mississippi State to the win after they fell 10-0 early in the action. The Bulldogs, who struggled to get going during the early phases of the contest, turned the ball over three-times in the first half when things were just not going their way, but the confidence never left. “At halftime, we just had to relax,” Prescott said. Meanwhile, the highlighted game of Week 10 came from the Vaught-Hemingway Stadium in Oxford, where No. 3 Auburn held on for a 35-31 victory over No. 4 Ole Miss. Both teams battled throughout the night and shared the lead on several different occasions, but it was the Tigers, who ended on top after holding their nerve late in the game. Nick Marshall completed 15-of-22 passes for 254 yards and two touchdowns for Auburn, but the highlighted moment came late in the game when Ole Miss’ receiver Laquon Treadwell, looked well set to score the winning touchdown, fumbled the ball at the goal line, and then broke his leg with less than two minutes left in the game. Cassanova McKinzy reacted quickly to recover the ball in the scramble, although replays had to be used to clarify the decision. With two defeats already on the season, it looks like Ole Miss’ (7-2) chances of making the playoffs is all but over. Other winners on the day were No. 5 Oregon, No. 7 TCU, No. 9 Kansas State and No. 10 Notre Dame. However, No. 11 Georgia fell 38-20 to Florida and No. 12 Arizona went down 17-7 against No. 22 UCLA. On Thursday, No. 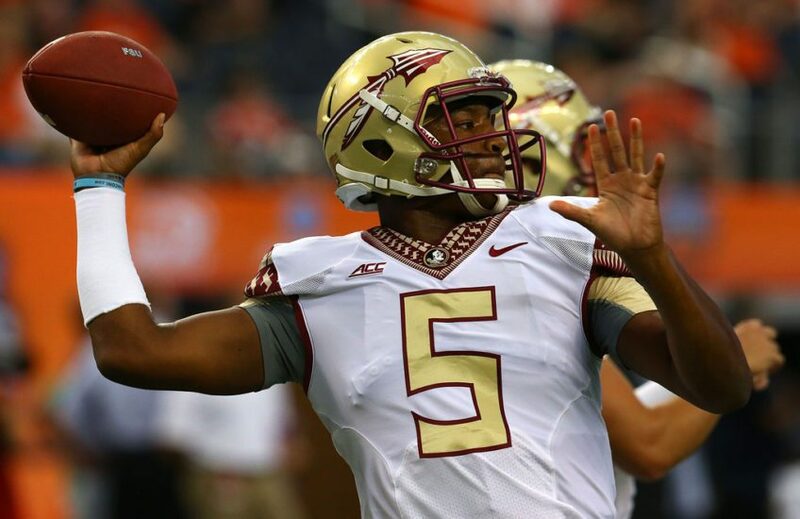 2 Florida State (8-0) came back from a 21 point deficit to beat No. 25 Louisville, 42-31. No. 2 Florida State 42 (8-0), No. 25 Louisville, 31 (6-4).